We’re very safety-conscious around here. Especially when it affords the opportunity to don cool headgear. An ascension to the heights, for example, is a splendid opportunity to sport the latest in padded plastic head armor. 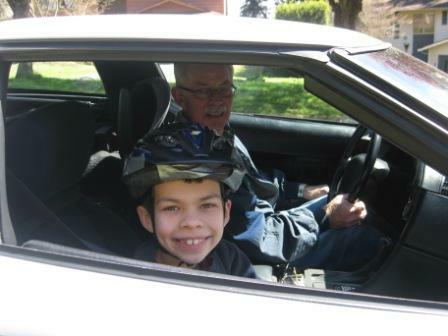 A ride in a sports-car might conceivably end in a situation warranting protective headgear. Although I submit that, given that the driver is Grandpa D – a former professional limousine chauffeur with many years of experience, that the likelihood of such devastation is unlikely. 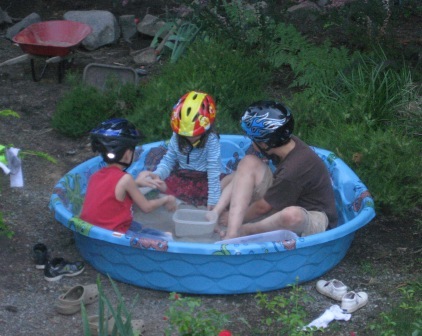 But – I fail to see the inherent risks that would lead three children to conclude that a quiet afternoon’s diversion in a sandbox would make helmets an utter necessity. I’m told that there is an ad or a video that is showing up at the end of this post. Please know that it’s nothing that I’ve put there or have anything to do with; it’s the cost of having a free blog. If there’s any advertising or video on this site, and I haven’t specifically referred to it in my post, then please discount it as being something that I have no interest in and have not asked for or promoted in any way. 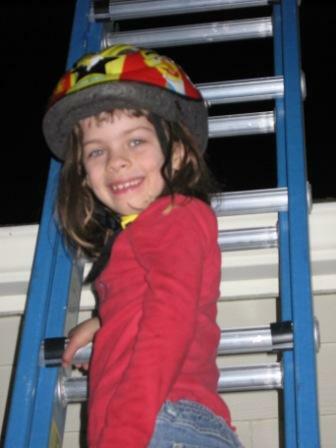 This entry was posted in Homeschool, The Present Insanity and tagged helmets, Kids, safety. Bookmark the permalink. Chuckle … I remember the kids leaving their helmets on all evening after biking, and I always wondered … do those things come off? ?